The Ithaca College football team defeated Buffalo State 7–0 Nov. 5 at Butterfield Stadium. The Bombers are now 5–4 on the year. Men’s soccer, women’s soccer and volleyball prepare for the Empire 8 Championships, while football gets ready for its last home game of the season. The Ithaca College men’s and women’s swimming and diving will kick off the fall sports seasons Oct. 22 against SUNY Fredonia and SUNY Brockport. The Ithaca College football team defeated Hartwick College 50–27 Oct. 8 at Butterfield Stadium. This weekend, the golf team finishes up its fall season and the women’s tennis team has its last match before the Empire 8 Championship. The Ithaca College football team upset previously undefeated Utica College 23–14 Oct. 1 at Butterfield Stadium. The Bombers are now 2–2. The Ithaca College football team lost to Alfred University 20–6 Sept. 24. The Bombers are now 1–2 on the season. The Ithaca College football team won its season opener for the 19th consecutive season. 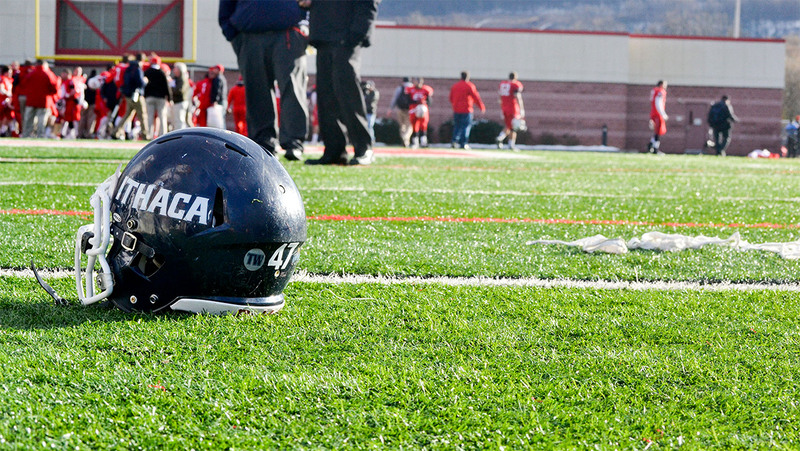 The football team looks beyond its sixth consecutive Cortaca jug loss and aims for a win this season to honor head coach Mike Welch’s last season.